The industry standard for imbedding a MP3 audio playlist on a website. Clean, intuitive, easy to deploy. Wimpy MP3 Player can automatically list and play and entire folder full of MP3 files directly on your web page. New MP3s can be added to your web page as simply as uploading the MP3 files. 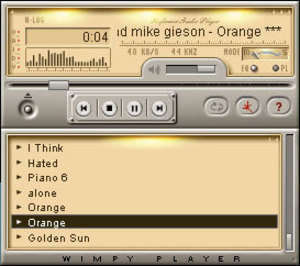 Wimpy MP3 Player 6.0.23 is a shareware program and can be used as a demo to try the software until the free trial period has ended. A full version of the program is available after the trial period ends. For security reasons, you should also check out the Wimpy MP3 Player download at LO4D.com which includes virus and malware tests. Additional screenshots of this application download may be available, too. Wimpy MP3 Player has a presence on social networks. Wimpy MP3 Player download been highly rated by our users.